Notre Dame junior guard Taylor Schmidt defends Clay senior point guard Skylar Artis. 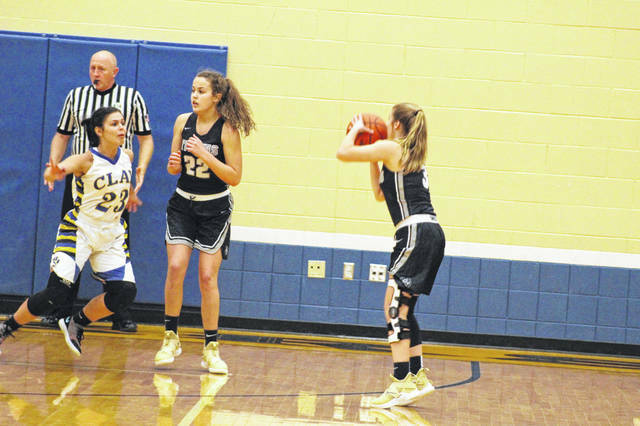 Notre Dame sophomore point guard Ava Hassel played her first game since a knee injury suffered in the Lady Titans regional semifinal game vs. Waterford in March. On a chilly Tuesday night in Southern Ohio, the Notre Dame Lady Titans showed in their first official game of the 2018-19 season exactly what they are capable of doing this season by defeating the Clay Lady Panthers 57-20 in both teams season and conference opening game. It was evident early on, as Artis noted, that the pace of play would be an issue for the Lady Panthers. Notre Dame jumped out to an 11-0 lead in the first quarter before closing out the quarter with a 15-5 lead. 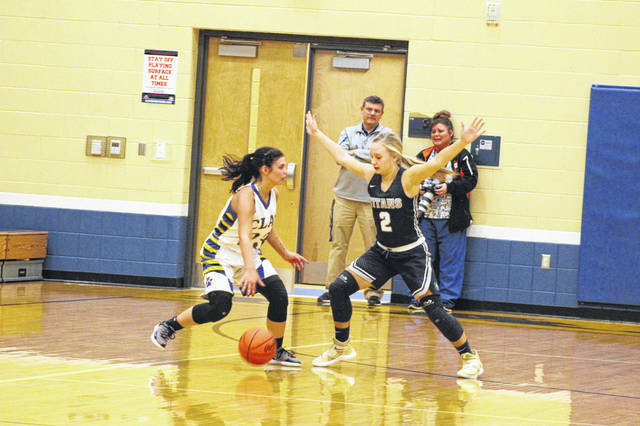 The defense and scoring ability of sophomore guard Ava Hassell of Notre Dame was very encouraging to see after she suffered a knee injury in the Lady Titans regional semifinal loss to Waterford earlier this year. The Lady Titans kept up the defensive pressure all night on Clay and were able to keep fresh legs in the game thanks to their bench depth. Notre Dame continued to execute on the offensive end en route to a 57-20 conference opener win over Clay to begin their 18-19 campaign. Leading Notre Dame in scoring was center Katie Dettwiller with 16 points, junior guard Taylor Schmidt with 13 points, and Hassell with 12 points in her first game off injury. The Lady Panthers were led in scoring by Artis’ daughter, Skylar, with eight points, while sisters Jaelyn and Jensen Warnock each scored four points apiece. Clay will travel to Green Thursday evening to face the Lady Bobcats in their second conference game in three days. Artis is hoping his team will, with their first game under their belts, be in a better position to compete in their first road game of the year. Notre Dame will host the Western Indians in their first conference home game of the young season Thursday night, a game where McKenzie is hoping his team will improve in some specific areas.